A few months after the end of the fiscal year, publicly traded multichannel businesses are required to share Executive Compensation with the public. It is always easy to pick on Executive Compensation. There are hundreds of examples of leaders being rewarded, while employees are downsized, or shareholders struggle to receive an adequate return on investment. Compensation works in different ways, depending upon where an employee stands in a multichannel company. The vast majority of employees are placed in "salary bands". These bands are determined by competitive reviews of comparable jobs at similar companies. Once an employee is "banded", s/he will earn an annual salary increase that is roughly similar to the increase in the cost of living over the past year. Outstanding performers may earn a bigger increase, employees at the bottom of the salary band may earn a bigger increase. Executive Compensation is more complex. Annual Salary. Let's say her annual salary is $350,000 per year. Performance Bonus. The bonus is usually based on the company achieving sales and profit objectives. This bonus might vary between 0% and 100% or more of her salary. During an average year, the bonus might be 50% of base salary --- maybe $175,000, paid after the close of the fiscal year. Stock Options. If the business is publicly traded, the employee is granted shares that can be redeemed. The employee might be granted 100,000 shares at a price (say $10 per share). The shares usually vest in increments, so that they are fully vested in four years. After four years, the share price should have hopefully increased enough to please investors. Say the share price, after four years, is $20. This employee could earn in 100,000 * ($20 - $10) = $1,000,000 in four years. The brand may elect to grant new shares each year, at the current price of the shares of stock. So, the humble Executive can earn maybe $1,000,000 a year, about a third is guaranteed, about twenty percent is variable on annual performance, and close to half is based on market performance. In a bad year, the CFO earns the base salary of $350,000. In a good year, the CFO earns $350,000 base salary, $350,000 bonus. If the business has numerous good years, the CFO can earn $350,000 base salary, $350,000 bonus, and $1,000,000 in stock options. So, we established that about 2/3 of the Executive's salary is "variable", highly dependent upon company performance. Now, let's go back to the base salary. Compensation Committees like to review "peer" businesses. In other words, the Compensation Committee will look at the salary of the CFO, and compare it with the salaries of CFOs at major competitors. Let's assume that company performance is "average", compared with the peer group. Let's also assume that this CFO is "under-compensated", from a base-salary standpoint, verses CFOs within the peer group. In other words, maybe the average CFO in the peer group earns $420,000. Here's the situation: You like to pay your leaders at the mid-point of your peer group. Do you increase the salary of the CFO to $420,000 a year, so that your CFO is compensated at a "fair" level, compared with other CFOs? If your answer is "no", why? Do you risk losing your CFO to a peer company that pays a better base salary, and if you do lose your CFO, what is the risk to your company? If your answer is "yes", why? What kind of message do you send to your garden-variety employees, who are earning $50,000 a year, and are struggling to pay bills with their 3%, $1,500 cost-of-living increase? What kind of message do you send to your hourly staff, who are earning $25,000 a year, and are really struggling to pay bills with a 3%, $750 cost-of-living increase? Have you ever evaluated the language you use, when speaking with Senior Management? Database Marketers are in a challenging situation, when it comes to communication. You cannot share the technical aspects of your work with anybody outside of your company, because your work is proprietary to your organization. In some instances, you can use "coded" language to speak with peers. I recall attending what used to be called the "catalog conference", back in 2001. Two of my managers and I were to meet with the executive and two managers of a competitor of ours. Our list management vendor organized the meeting. We had six of us from our two companies, and ten individuals from at least three list vendors, sixteen folks in total. In a small hotel room. One bed. Maybe five chairs. One hour. A small assortment of Diet Coke and Seven-Up. I wouldn't share the true state of our business (we were missing plan by high double-digits), my peer from across the hotel room wouldn't share the true state of her business. I recall saying that "business was close to meeting our re-forecasted expectations, and that we were optimistic about some of the changes were were implementing". That's "coded" language, alright! It's not easy to say that the internet is destroying our business model, and that we'll be lucky to have three of the sixteen folks in the room still in their jobs in five years. So we use "coded" language when talking with folks outside of our company. Within our company, we get a small number of opportunities to dazzle Senior Management. These are the two or three times a year we are requested to share business findings with the leaders of the company. Unless the political climate stifles candor, this is our one chance to "rock somebody's world". So we craft a spectacular Powerpoint presentation. We try to cram facts, useful metrics, sage-like insight and strategic direction into the document, slide, or presentation. We share the slide with our co-workers. Everybody offers their opinion. A font should be larger. Cones should be red, not pink. One axis should be labeled, the other not because it is in the legend. Numbers should be listed above the cones, so that Senior Management can see the relationships, or read the actual numbers. An appendix is included, with all of the detail. We're ready! We dress up for our meeting. We wear extra deodorant. We might spend $75 coloring our hair. Appearance matters!! We arrive to work early. We kibitz about the meeting with co-workers. We chew on a few mints. And then we're called into the boardroom. Inside are thirteen stressed, semi-pleasant individuals. Some give us a half-hearted smile. Our Vice President introduces our team, and invites us to share our findings. We present our carefully constructed slide, and after six minutes of explanation, everything goes sideways. One member of Senior Management wants to know the difference between DMPC, Dollar-Per-Book, RFM, Click-Thru Rates and Shopping Cart Abandonment. Another is busy using her thumbs to type a text message to a member of the information technology team via her Blackberry. The gruff individual at the end of the table just received a written message on a pink piece of paper from his administrative assistant about a labor dispute at the distribution center. We spend another three minutes desperately trying to save the presentation. We answer a few pointed questions, we perceive that the entire Executive Team completely misinterpreted our work, we cringe when they decide to do the exact opposite of what we recommend. And then the worst part of the meeting happens. The CEO looks directly at us, and tells us that next time we are to avoid using "geek-speak", to "stop using so many numbers". "Just tell me what I should do." are the words we're left with as we leave the board room. We're convinced that "management doesn't get it". In my new role, I see this happen repeatedly. Well-meaning Database Marketers, Web Analysts, Catalog Circulation Experts and Online Marketers use the language of their peers, their niche, to dazzle Senior Management. Senior Management just gets crabby, in response. When business is good, our language, our "lingo" is tolerated. When business is bad, we're just 'geeky twits'. Our credibility is hurt. It can be tough to be in our profession. We can't share much with our peers, folks at other companies who would understand us. Our leaders don't understand our jargon, our communication style. In my final months at Nordstrom, I recommended we talk like "we were talking to Oprah". Sometimes, it has to be simplified to that level --- simplified so that Oprah's entire audience can understand it. This at least gives your Executive team a fighting chance! The art of storytelling has never been more important in Database Marketing. Business models are being transformed, and Executives don't know how to interpret what they are seeing. Find everyday language that is culturally appropriate, and create a niche for yourself (or a co-worker of yours) as the "translator" ... the person who takes technical information and converts it into everyday language that an Executive can understand. We'll watch with excitement as LunaMetrics drops like a rock, due to a migration from Blogger to a new URL. Blog ratings tools don't like change, and as a result, are penalizing LunaMetrics. 1 = Occam's Razor at a BlogJuice ranking of 6.7 (that's good, FYI). 9 = Luna Metrics, 1.6 (was 4.8 prior to the URL change, let's watch this site climb the charts). The analyst illustrated that the additional catalog drove $6.00 of sales per customer. But in reality, two dollars were cannibalized from surrounding catalogs, yielding just $4.00 of true incremental value. The additional catalog was 66.7% "incremental". A profit and loss statement would be run on 66.7% of the "demand" that financial systems indicated the catalog generated. Fast forward to 2007. You run an online business, with two merchandise divisions. You add a third merchandise division, adding new skus that did not previously exist. Average Order Size = $100. Total Demand = 1,000,000 * 0.04 * 100 = $4,000,000. Merchandise Division #1 = $2,000,000. Merchandise Division #2 = $2,000,000. Average Order Size = $105. Total Demand = 1,050,000 * 0.042 * 105 = $4,630,500. Merchandise Division #1 = $2,200,000. Merchandise Division #2 = $1,900,000. Merchandise Division #3 (New Merch) = $530,500. The challenge in the online environment occurs when evaluating the $530,500 of demand attributed to the third merchandise division. What would have happened to merchandise divisions one and two, had the new merchandise not been offered? On the surface, it appears that the new merchandise division helped increase visitors, conversion rate, and average order size. What information/metrics would you like to see, to complement this analysis? If you had a meeting with your CEO, and your CEO wanted to know what the true contribution of the third merchandise division is to company demand, what would you tell her? "We've found little correlation between our client's actual PPC spend and the numbers reported by SpyFu. For the sites we checked, SpyFu was off, sometimes by an order of magnitude, for small ($10k/month), medium ($100k/month), and large ($500k/month) advertisers. A neat idea, but needs better accuracy." One of the great things about blogging is that folks can point out flaws in the work others do. And when folks do it in an honorable way, everybody benefits. Alan and team have built a great business --- please check his team out. Now in the seventh week of my own business, I have to continually think about what a "fair price" is for the services I provide. Maybe the market will let me charge $2,000 for a project. What if a "fair" price is $400, given the actual amount of work I have to do? What should I charge? $400? $1,200? $2,000? Jaffe Juice talked about this topic today. Is it ok for Starbucks to charge $3.00 for a cup of coffee? Is it ok for Nordstrom to charge $350 for a handbag? Is it ok for a plumber to charge a high hourly rate because nobody else performs the services he performs in the town he lives in? Back in 1990, you'd feed a 5.25 inch floppy disk into your IBM-AT desktop computer. You'd fire up SPSS. At the bottom of the screen ticked the number of records that were being processed .... 20 records ... 40 records ... 60 records ... 80 records. Today, I loaded a large dataset, wrote six hundred lines of code, and began processing the information. At the bottom of the screen, I could visualize the records as they were being processed ... 200,000 records ... 400,000 records ... 600,000 records ... 800,000 records. Thank you, Acer, AMD and SPSS for providing a fun computing environment. It's a blast to see new data, information you haven't been exposed to before. The data at Nordstrom seldom changed during my six years there. Sure, occasionally the annual retention rate would vary (maybe 67.2% one year, then 69.3% the next year --- if you are at Macy's or Neiman Marcus or Saks, sorry, those aren't the actual numbers). New customers might vary by fifty thousand verses forecast. There were seldom huge surprises. Such is the case when a business consistently meets or exceeds expectations. When you get to see new data from a new company, there is a sense of exhilaration. It is like opening up a box of puzzle pieces. You find the corners and the border pieces first. Each piece fits into another piece. Eventually, the pieces provide a path for you to get to the end of the assembly process. Each line of code produces reporting --- the reporting tells a story. Existing customers are retained, lapsed customers repurchase, new customers feed the future growth of a business. Within minutes, the lifeblood of a company is evident on your computer monitor. Looking across years, you can visualize the decisions that executives made, decisions that caused increases or decreases in customer counts. These increases or decreases drove subsequent decisions, which drove increases or decreases in customer counts. Within an hour, Multichannel Forensics illustrated what happened, and forecast what is likely to happen in the future. Suddenly, there is a story to tell. There is a huge difference between Data Mining and Storytelling. Data Mining seeks to explain the data. Storytelling is an art form that translates information in a way Executives can digest, understand, and act upon. Data Mining has a place without Storytelling. Data Mining coupled with Storytelling yields potential. Data Mining and Storytelling that speaks directly to a current, future or perceived Executive need (as defined by the Executive) causes change. If you believe the phrase "It is 'x' times cheaper to retain a customer than to acquire a new customer", you'll have a wonderful lab experiment to monitor, courtesy of the plight of Vonage (thanks, Jim Fulton). "It's the difference of cutting off oxygen as opposed to the bullet in the head," Warin reportedly said. Urging the judge to reconsider, he added that the decision would "in effect slowly strangle Vonage." What would you do if your company were not allowed to market for new customers anymore? What levers would you pull to prop-up sales as long as you possible, before your business imploded? Using SpyFu, one can get very rough estimates of what leading brands spend on online advertising on a daily basis. The data is prone to errors and inaccuracy, but can be used to view general trends. Take three companies that thrive on catalog marketing, namely L.L. Bean, Lands' End, and Pottery Barn. Here is what SpyFu suggests these companies spend in online marketing, on an annual basis. Annual Average Spend Across These Brands = $10,201,000. Average Annual Clicks Generated From The Advertising = 12,015,000. Average Cost Per Click = $0.87. Next, look at three large retailers, namely Macy's, Nordstrom and Neiman Marcus. Here is what SpyFu suggests these companies spend in online marketing, on an annual basis. Annual Average Spend Across These Brands = $23,550,000. Average Annual Clicks Generated From The Advertising = 33,312,000. Average Cost Per Click = $0.78. Finally, look at two larger-sizes online pureplays, namely Zappos and Blue Nile. Here is what SpyFu suggests these companies spend in online marketing, on an annual basis. Annual Average Spend Across These Brands = $40,654,000. Average Annual Clicks Generated From The Advertising = 63,483,000. Average Cost Per Click = $0.68. Notice that as we progress from companies with a catalog heritage, to companies with a retail heritage, to companies with an online heritage, the amount of online spend dramatically increases --- and, the average cost per click actually decreases. This is counter to what analytical folks expect to see happen. I tried to pick companies that had annual traffic that was directionally similar. How the businesses use advertising to drive web traffic is very different. What this does show is that there may be a marketing digital divide. There may be a way for catalogers and retailers to migrate advertising online, and actually see better returns on investment. As postage escalates, traditional catalogers have an opportunity to emulate the techniques that the folks at Zappos and Blue Nile use. Over the next five years, there is an opportunity to transition advertising strategy from print to online. There is an opportunity to cross over the marketing digital divide. If you watch American Idol, who do you think is likely to win? If you enjoy basketball, which teams are likely to end up in the NBA Finals? If you follow technology, which company is likely to be most successful in five years, Google, Yahoo! or Microsoft? Which car company is likely to increase market share the most over the next five years, General Motors, Toyota or Hyundai? Which Democrat and Republican candidates are likely to survive the primary process, and become candidates for President of the United States? Now, try answering these questions about the company you work for. What are the net sales and earnings before taxes forecast for this fiscal year for your company? Is your company, year-to-date, exceeding, meeting or missing sales and profit expectations? Given the trends in the ability of your company to acquire new customers and grow existing customers, what is the forecast for net sales and profit for each of the next five years? If you stopped advertising via your most effective advertising channel (catalogs, paid search, portals, television etc. ), how would your five year forecast of sales and profit change? If you stopped producing your most popular category of merchandise, how would your five year forecast of sales and profit change? If you stopped producing the merchandise that sold in the bottom third of all merchandise you sold, how would your five year forecast of sales and profit change? It is always interesting to see the reasonable accuracy humans achieve when predicting the future. We love predicting the future! We seem to have an intuition to make predictions. We combine external facts with personal experiences to make educated guesses about events that might unfold. We're pretty good at doing this, too. We know we should avoid our favorite restaurant at 7:00pm on a Saturday night, if we want to be seated immediately. We can predict what the siding on our house will look like next spring, and as a result, determine when we should paint, stain, or replace our siding. We are not good at forecasting the future trajectory of the businesses we lead. We know what sells today. Our merchandisers do have an instinct for what might sell in the future. But the rest of us are not great at forecasting the future trajectory of our business. We are great at seeing how external forces impact other businesses. We read that Google purchased Doubleclick, and we begin theorizing what this means for Yahoo! or Microsoft. We are not good at thinking about what happens within our own business when we add new products, eliminate old products, increase advertising, decrease advertising, or re-allocate advertising dollars to new advertising channels. I don't think this is necessarily our fault. Tell me the last time your company was forthright with you about your business. When was the last time your company opened up the books, and shared everything it knows about the future trajectory of the business with you? Over the next few weeks, I'll elaborate a bit more on the topic of forecasting the future of the businesses we lead, sharing tools and approaches for figuring out where we are heading, and what we can do about it. Time for your opinion. What do you think? Do we, as leaders, do a good job of forecasting the trajectory of the businesses we lead? In the first quarter of 2007, sales of music compact disks declined by twenty percent verses last year, as consumers continue to abandon album-based compact disks in favor of ala-carte purchases/sharing of digital music files. The music industry strongly believes that free file sharing is responsible for the decline in CD sales. The labels are flexing their muscles where they can, to maintain their system of monetizing music even if it means heavily penalizing a new channel where music fans are enjoying music. The crash of television and radio, the ascension of the internet, and the convenience of the iPod changed the music industry forever. Multichannel Forensics suggest that consumers "transfered" their behavior from CDs to MP3s during the late 1990s through the past few years. Once consumers landed in a new world of music, they stayed there. In Multichannel Forensics, we call this "isolation". No matter how hard the music industry tries to bring consumers back to the old method of monetized music, the effort is futile. Consumers have moved on. As consumers, we have a unique, God-given ability to identify trends in the marketplace. We can literally see the future, and react accordingly. As business leaders, we have a unique, God-given ability to identify trends in the marketplace. We can literally see the future. However, we don't react accordingly. Instead, we dig in our heels, and demand that consumers and business partners come back to our way of thinking. My beloved catalog industry falls into this category. Our customers can see the future, and are anywhere between 20% and 80% of the way toward evolving their behavior. At this time, customers are generally in "equilibrium" --- the state where they go back and forth between channels. They use catalogs and purchase over the telephone. They use catalogs and purchase on our websites. They ignore our marketing activities, use Google, and purchase on our sites. The combine our marketing activities with Google, and purchase on our sites. Google recognizes this, and gobbles up properties that allow them to have an end-to-end marketing relationship with our future customers. Their version of an end-to-end marketing relationship does not include paper. Over the next five years, our catalog customers will leave "equilibrium" mode, shifting to "transfer" mode. They will define a new way of interacting with brands, a new way of shopping. When that happens, what will become of what has been known for more than a hundred years as "the catalog industry"? We can dig our heels in, and continue lauding the importance of sending paper to our customers as a way of generating sales. In this process, we must fight postal reform. We can also give up. We can sell our businesses, getting out before big changes happen. Or we can build a five-year plan for the future of our industry. We can be like a pilot, who takes an airplane down from 30,000 feet to a gentle landing. We can work with our customers as we reduce our dependence upon catalogs, building an infrastructure that allows customers to pull information from us. We must thoroughly evaluate how Zappos, Endless, Piperlime, Blue Nile, and Amazon drive sales without paper. We need to emulate what they do well. We need to use our experience to capitalize on what they don't do well. We must chart a path to the future. Folks in the music industry are actively talking about a path to the future. It's our turn to do the same. It will require a leap of faith, right over that pesky Marketing Digital Divide. There's no shortage of interesting tools that can be combined to understand our competitive online marketplace. Quantcast is one such tool. Type in your URL. The tool estimates your daily traffic, monthly unique visitors, the websites your visitors frequent, and various demographics. Directionally, it isn't a bad tool. By looking at the websites that your visitors frequent, one can apply the concepts of Multichannel Forensics, yielding this "map-in-progress" (click once on the map for a larger image) of the relationship between various online retailers and the visitors who frequent their sites. At first, I was looking at two dozen apparel retailers --- then the project expanded, resulting in nearly 120 online apparel businesses, as well as businesses closely aligned to the apparel industry. While the individual observations yielded by Quantcast are undoubtedly biased and somewhat incorrect, the relationships depicted in the map are largely intuitive. Higher-end department stores "anchor" the middle-left area of the map (Saks, Nordstrom, Neiman Marcus, Bloomingdales). Visitors frequent these sites, and also visit sites in a circle around the department stores. "North" of the department store "anchor" you find businesses that appeal to the upper-end of the Baby Boomer generation. "South" of the department store "anchor" you find businesses that appeal to younger customers. You can almost see the "Marketing Digital Divide" at play here, as Zappos, Piperlime and Endless appear in this general area --- along with other youthful brands. Moving across the map to the right, you see a department store transition occur --- from Saks to Dillards to J.C. Penney to Sears/K-Mart/Wal-Mart. Kids and Shoe retailers appear just below and to the right of this general progression. Most interesting to me is the competitive bloodbath that occurs in the middle-left section of the map. Surrounding the department store "anchors" are largely catalog-based (above) and online-based (below) websites. Because these retailers are plotted close to each other, the map suggests these retailers "share" the same customers. Quantcast suggests that website visitors are visiting many of these sites. Quantcast is suggesting that these businesses largely share the same customer base. Marketing, merchandise assortment, price/value and creative/branding strategy become key differentiators among similar businesses with similar customers. Multichannel Forensics can also be used to demonstrate that the competitive forces illustrated in this map occur within your very own company! In other words, the same competition/cooperation that occurs between Gap and Gymboree in this map also occur between the products, brands and channels that you use to sell merchandise to consumers and businesses. Intuitively, we understand the competitive forces that happen between companies, and across industries. Within our own businesses, we sometimes have a harder time conceiving these trends. And yet, it's these trends that give us the opportunity to think strategically, to consider what is best for our customer, to chart a path to increased sales and profits. Over the next decade, as we cross the Marketing Digital Divide and manage web-based businesses, we'll need to better understand external and internal ecosystem interactions. Let's fast forward to January 1, 2009. Mailing catalogs is now cost-prohibitive, due to a 300% increase in postage brought on by another round of postal reform. You're an executive at L.L. Bean, the venerable catalog giant located in beautiful New England. You just completed fiscal 2008, a year in which you drove $900,000,000 in net sales via your website, and $600,000,000 via the telephone. Maybe you spent $250,000,000 marketing catalogs to your customers. Take away the catalogs, and the expense associated with them. Could you re-allocate $250,000,000 via online marketing? Where would you spend it? Do you have any confidence that e-mail could replace catalog as the primary sales driver? How would you change your e-mail strategy? Your website generated $900,000,000 in net sales in 2008. What is your forecast for web sales in 2009, sans catalog? You generated $600,000,000 in net sales in 2008 via the telephone --- folks who read the catalog, and called a sales associate to place an order. Without a catalog, what is your sales forecast for 2009, over the telephone? You had 115,000,000 website visits in 2008. How would you change your marketing strategy to capitalize on this enormous informational resource known as www.llbean.com? How much would your traffic change if your catalogs didn't exist? Of course, the USPS isn't going to make catalog marketing impractical in 2009. That being said, if you went through this exercise, could you recover your sales via the marketing techniques that Amazon or Zappos or Blue Nile uses --- companies on the other side of the Marketing Digital Divide? At minimum, your executive team should have answers to these questions. Over the past three years, many individuals have used the blogging platform to hammer brands, to share points of view, or to promote an analytical methodology that is the cornerstone of their small business venture. I've noticed that it is easy to build traffic and conversation when you hammer brands. It can be intoxicating. You take a few shots, you get people to leave comments, your traffic doubles, you feel like you're changing the world. I've often wondered why brands don't use their platform and audience to fight back. Reputable PR blogger makes a comment on Twitter about a reputable brand. Reputable brand uses a PR blog to respond. Reputable PR blogger issues apology. Recall that Circuit City elected to eliminate higher-paying positions on the sales floor of their stores. In a transcript of their fourth quarter earnings results, management states that "There is no data in the company’s analysis that the service level has dropped due to the absence of the top paid employees." Here's where I'd appreciate your input. Do you believe that a company can provide the same service levels without the store employees who were compensated the most (increased compensation would imply more talent or more experience)? If you were Circuit City management, what would you do to compete against Best Buy and web-based electronics retailers? What would you do from a merchandising, pricing, service, in-store presentation, or strategic standpoint? The good folks at Intelligent Results and I are partnering on a webinar about the emerging field of research known as Multichannel Forensics. My presentation will be on May 15, at 1:00pm EDT, 10:00am PDT. This is a free webinar. Simply click on this link to register. This will be a good opportunity to hear more about the topics I've been sharing with you over the past several months. I'll have a chance to explain the concepts in greater detail. What role should my website play in my retail-based business? What role should my catalog play in my direct-to-consumer business? Should I dramatically cut my catalog marketing program, re-allocating expenses to online marketing programs? How do my customers cross-shop my website or store? These questions are at the heart of what Multichannel Forensics are designed to answer. Please join me on May 15, as I talk about these topics in greater detail. So often our businesses grow and evolve, and we don't thoroughly understand why they are growing or evolving. Take this example. This is a web-based business, selling Women's Casual Clothing, Men's Clothing, Children's Clothing, and during the past two years, management added a Women's Professional Clothing line. In total, the business is growing at about the same rate, year-over-year, for the past three years. If this business is growing at about the same rate, year-over-year, what does this tell you about the health of each individual merchandise division? In other words, take a look at the number of customers, spend per customer, total spend, and growth rates of each merchandise division. Once you've analyzed each merchandise division, answer the following questions in the comments section of this post. Question #1: Is the customer file more healthy, or less healthy, since adding Women's Professional Clothing to the merchandise assortment? Question #2: Is this business growing because of its ability to add customers, or its ability to get customers to spend more? Question #3: If you were the Vice President of the Women's Casual Clothing merchandise division, how would you feel about the growth of your business unit? Question #4: If you were the Vice President of the Children's Clothing merchandise division, how would you feel about the growth of your business unit? Question #5: What additional information would you like to have available to you, in order to better diagnose the heath of this business? Question #6: How many "multi-divisional buyers" do you have, by year? In other words, how many customers purchased from multiple merchandise divisions? I am coming around to the idea that a "Marketing Digital Divide" is happening all around us. I like to read the point of view of many different marketing folks. This morning, this article arrived via Google Reader, from Andrew Chen. Andrew didn't gain his experience in the catalog industry. His marketing skills were honed in Seattle and Silicon Valley, during the internet era. His article is titled '10 Obvious Strategies To Ruthlessly Acquire Users". Here are the ten strategies that he outlines. Do the phrases "Instant Messaging", "Widgets", "MySpace", "Social Networks", "Auto-Embed", "Blogs" or "RSS" appear anywhere on your list of customer acquisition strategies, if you're a Multichannel Cataloger or Retailer? Remember, Andrew calls these "obvious" strategies. Imagine what his list of less-than-obvious strategies looks like. How many of my loyal readers, direct marketers with decades of experience, view these strategies as "obvious"? This is the essence of the "Marketing Digital Divide". A generation of marketers are honing skills in a realm most Multichannel Catalogers or Retailers cannot envision. It seems to me that the "MDD", as I'll call it, is accelerating. And if you don't practice any of the items Andrew outlines, it becomes harder and harder to see them, to understand what is being done. This might be a great time for Millard, or Mokrynski, or MeritDirect, to reassign job responsibilities to small number of individuals. These individuals could focus on Andrew's list. These folks could test Andrew's proposed strategies with progressive Multichannel Catalogers and Retailers willing to experiment. These individuals could spend time with "Web 2.0" folks, if you will, folks who are practicing these activities --- and then transfer the knowledge back to progressive Multichannel Catalogers and Retailers. The Marketing Digital Divide isn't too big to cross, yet. With postal reform bearing down on catalogers, with Google dominating the online advertising space with their acquisition of DoubleClick, it's a great time for our list industry to build out solid Web 2.0 divisions that help transfer skills across the Marketing Digital Divide (MDD) to Multichannel Catalogers and Retailers. What are your thoughts? Does the Marketing Digital Divide (MDD) exist? Are catalogers and retailers falling behind? The Catalog Quiz: Should You Market Via Catalogs? I enjoyed a great discussion with a friend today, regarding my punditry about the demise of catalog marketing. I am wrong to say that catalog marketing is dying ... as wrong as the punditry I talk about on this site. Catalogs are appropriate if your customers buy from them at rates that yield a positive short and long-term return on investment, preferably an ROI that is increasing over time ... regardless whether they buy over the phone, online, or in stores. End of story. The issue becomes, "Is catalog marketing appropriate for your customer base?" Let's take a quiz, and see if catalog marketing is appropriate for your business. Of course, this is largely done to prove a point, it isn't designed as an advertising filter to be used for strategic purposes. Question #1: How old is your average customer? *** Age 50 or Older (3 points). *** Age 40 to 50 (1 point). *** Age 0 to 40 (0 points). Question #2: What are the annual sales of your direct division (telephone + online)? *** $0 to $30,000,000 (3 points). *** $30,000,000 to $100,000,000 (1 point). *** $100,000,000 or more (0 points). Question #3: Where, on average, do your customers live? *** Upper Midwest, Great Plains, New England (3 points). *** East Coast, Southeast (1 point). *** Rockies & West Coast (0 points). Question #4: What is the average annual income of your average customer? *** $0 to $55,000 a year (2 points). *** $55,000 to $100,000 a year (3 points). *** $100,000 or more per year (0 points). Question #5: How urbanized is your average customer? *** Urban Customer (0 points). *** Suburban Customer (1 point). *** Rural Customer (3 points). Question #6: What do you believe is the purpose of your catalog? *** To sell merchandise today (3 points). *** To sell merchandise via any channel, telephone, online, retail (1 point). *** To "represent the brand" (0 points). Question #7: What is the heritage of your business? *** Originated as a catalog business (3 points). *** Originated as a retail business (1 point). *** Originated as an online pureplay (0 points). Question #8: Do you believe that catalog marketing is .... ? *** Art and Science (3 points). Question #9: Are you willing to share your customer base with your competitors? In other words, is it ok for your competitors to rent or exchange customers for mailings with you? *** Yes, absolutely (3 points). *** Something about this makes me uncomfortable (1 point). *** Never. I will never share my customers with my competitors (0 points). Question #10: Are you willing to hire catalog talent, folks who may require that, in order for the catalog to be most effective at driving sales, that it looks/feels/is-merchandised different than the way the Chief Marketing Officer perceives the brand to look/feel/be-merchandised? *** There should be a discussion, and compromises on both sides (1 point). *** No, the CMO owns the look/feel/merchandising of the brand (0 points). Add up the points from each question in your quiz. How did you do? 24 to 30 Points: Your business will be well-served by a catalog for years to come. 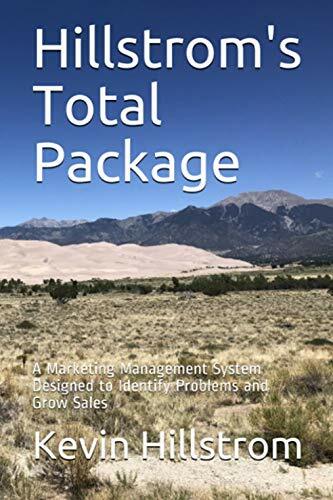 16 to 23 Points: Your business should continue using catalogs as part of your marketing mix, though productivity of the mailings may not be optimal. 8 to 15 Points: Catalogs may be a vehicle that is used to promote your brand. 0 to 7 Points: You are better served allocating advertising dollars to other advertising channels. Question #1: Individuals who enjoy shopping catalogs are frequently in the baby-boomer generation. Of course, this is a generalization. Work with your list processing vendor, do a demographic overlay, and answer this question for yourself. Question #2: Small business seldom have a vehicle that is as powerful at promoting the business as a selling catalog. Large businesses have name recognition that alone drives traffic to a website or a retail store. Small businesses can thrive by using catalog marketing. Question #3: Catalog customers frequently live in the Upper Midwest and New England. Graph your sales by zip code, and see what the story tells you. Question #4: As customers become more and more wealthy, behavior changes. The retail shopping experience, and luxury, frequently begin to overwhelm the habit of causal shopping via catalogs. Question #5: If your business is direct-to-consumer only (no retail channel), your best customers are likely to be suburban, or rural. Sears and Wards thrived on rural customers a hundred years ago. Multichannel retailers with stores occasionally leverage catalogs to drive store traffic in urban areas. Question #6: If you want a successful catalog business, you need to close sales today. Branding can be done for a lot less money if catalogs are not part of the mix. If you are going to invest a dollar to put a catalog in someone's home, you need to get $6 of sales in return for your hard work. Question #7: Heritage makes a big difference. Traditional catalogers, those who have built their business via cataloging for decades, need to continue to leverage this advertising medium. These folks need to be advised that the world is changing --- and at some point, their customers are likely to use other advertising channels to purchase goods. Question #8: Catalog marketing is both art and science. Those who beautifully balance both have success and longevity. But if you have to choose between art and science, and you care about a good return on investment, pick science. Choose the merchandise and creative execution your customers demand from you. This isn't a place for willy-nilly experimentation. Question #9: We've all purchased from a catalog company, only to see your mailbox flooded with catalogs from a myriad of companies within twelve weeks. The catalog industry is built on a steady stream of new customers. Those customers come from list rental and exchange relationships with competitors. If you don't want to put your customers through this, then you better have a clever way to acquire new names, or a catalog isn't right for you. Question #10: In spite of what pundits tell you (same look and feel of all marketing across all marketing channels --- seamless, integrated), making catalogs perform really well may require a different creative and merchandising strategy. Customers who respond to catalogs may not be the same as your core customer (the customer who shops online or in stores). You can choose to market to this unique individual, or you can choose to reduce your productivity in an effort to market the same across all marketing channels. Ok, your turn, what questions did I fail to ask, and where are my comments/assumptions incorrect? Speak up!! Bass Pro Shops joins Orvis in the sale of log cabins via catalogs, according to DMNews. This is an interesting way to differentiate yourself from all of the other businesses targeting middle and upper-income Americans. The gross margins can't be bad either. Many of you may not be aware that selling homes via mail order is a concept that is a hundred years old. Sears, which amazingly placed catalogs in one out of every four homes back in 1908, sold homes via catalogs. The article is worth reading, proving yet again that Multichannel Marketing has been around for a century, proving this is not some new, mysterious concept. One word in this DMNews article caught my attention: "Integration". The search folks have a very different mindset than traditional catalogers have. Second Life isn't necessarily the future of the internet. Something like Second Life is the future. That future is an obvious threat to today's version of the search industry. Before the future even becomes relevant, the search folks call for "Integration". Catalogers are still arguing over whether printed, perfect-bound or saddle-stitched creative pieces drove an online sale, and are arguing over who gets credit for the sale. The search folks see the future, and quickly call for "Integration". Online, Offline, Second Life, it doesn't matter. "Integration" is so much more useful than "Multichannel". Catalogers and Retailers demanded credibility in the face of online competition, crafting the "Multichannel" moniker. "Integration" demands credibility, demands inclusion. You wouldn't integrate something unless it was useful and important. It requires all parts to fulfill the whole. Bubbling under the surface of the "Multichannel" evolution of the Catalog industry is a subtle shift in power in our organizations. Certain job functions have always been important, and will continue to be important in the future. In the companies I've worked at, the Merchandising organization is the heart and soul of the business. Business is good when customers like the merchandise, business is not-so-good when customers don't like the merchandise. Therefore, Merchants will always have one of the most powerful roles in our businesses. Some job functions are essential, regardless of the evolution of the online channel. Inventory Management, Quality Assurance, Finance, Information Technology, Human Resources, and Operations (Pick, Pack & Ship and Call Center) will always be needed. Some job functions represent the future of our business. Online Production is critical --- getting merchandise and copy on the web is critical. E-Mail Marketing, Online Marketing and Web Analytics represent the future of what used to be called "Database Marketing" or "Circulation". These folks are managing the way brands now interact with customers. Because these areas are in their relative infancy, they don't have a strong, strategic role in our businesses. These areas are all-too-often "silo-based", failing to view the business the way a customer views the business. These areas focus too much on individual campaigns, individual visits to the site, and response only through the online channel. In the future, these areas will improve their ability to analyze customer behavior over time, across channels. When these areas accomplish this feat, they become key strategic partners in our businesses. Database Marketing (Circulation) and Print Production represent the history of the Catalog industry. Many of the most experienced and knowledgeable individuals in our industry work in these areas. Many of these individuals are being cut-off from the future of our business. Over the next ten years, these individuals need to upgrade skills, and somehow gain experience in E-Mail Marketing, Online Marketing, and Web Analytics. Integrated, strategic businesses combine all aspects of Print Production and Online Production. They have already integrated Database Marketing, Online Marketing, E-Mail Marketing, and Web Analytics. Employees possess skills across these disciplines in the businesses that see the future, and are reacting to it today. Other job functions are under attack, our industry just doesn't realize it, yet. Public Relations, Brand Marketing and Creative/Copy are all being compromised in what used to be the Catalog industry. PR and Brand Marketing had a lot of control over the message. As consumers gain more control in the relationship with a brand, the PR/Brand Marketing folks will have to adapt. Creative/Copy will slowly lose the ability to tell the story to a customer. In Catalog, the Creative/Copy folks control the story via each page in the catalog. Online, there is no story --- the customer picks and chooses where she wants to go. A brand simply cannot tell a cohesive story across a thousand or ten thousand or a hundred thousand unique and dynamic web pages. As our business model moves entirely online, the power structure of our organizations will change. 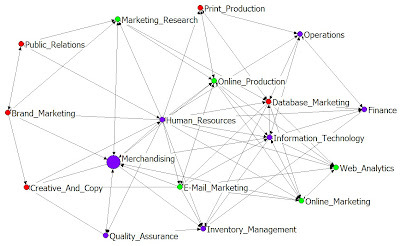 In the image, lines represent established working relationships. Notice that web-based jobs are generally on the outside, lower right hand side of the image. The online production folks are generally integrated with the business. As jobs evolve, working relationships will change. It becomes important for folks to view where the business is heading, and then build relationships and skills that align with the future. Of course, these relationships are different within every business. What are you seeing in your business? Do you observe these trends, or, do you observe something different? How about in different industries, what do you observe? Many of you plan to embark on a brave new world that may cause increases in postage of more than twenty percent, courtesy of postal reform. If you fall into this category, give this paper a read. The paper uses Multichannel Forensics to illustrate how a $39 million dollar business fails to grow, yielding a $29 million dollar business in just five years, due to reductions in catalog circulation caused by the increased expense of postal reform. Multichannel CEOs and CFOs: Please read the paper, and think about the long-term health of your business as you wrestle with this significant increase in expense. I forget where I saw this service used --- it's called "Witty Comics", and this is the first comic strip I created using the service: "A Multichannel Discussion". The image is a bit hard to read, so it might be better to click on the hyperlink. "But, as one statistician to another. Are you not in danger of making unfounded generalisations about blogging based upon a hugely inadequate number of observations." The answer to Graham's question is "YES"! I'm absolutely in danger of doing this! Graham's comment is insightful and correct. Early in my career, when it was my job to be a statistician, it was my job to be "right". I made sure that my work was perfect, that my conclusions were rock-solid and air-tight. I was given months to complete a project. Those were good times. In 1998, I became Director of Circulation at Eddie Bauer. I was member of the "Catalog Business Team", a group of Directors and VPs responsible for meeting or exceeding budgeted sales and profit goals for the Catalog/Online division at Eddie Bauer. We met as a team every Wednesday morning. Questions would come up, questions that required rapid answers. For instance, the Merchandise executive might say "We're killing this business by running Mens merchandise in the first twenty pages of the catalog. Let's stop this practice, and run best-selling Womens merchandise in the first twenty pages." Maybe we ran Mens merchandise in the front of the past two catalogs, and maybe those two catalogs were ten percent below our expectations, whereas the prior five or six catalogs met expectations. On the surface, the merchandising executive seemed to have a point. As a statistician, you'd like to run a series of experiments, and prove that Mens merchandise was killing the performance of the book. However, these experiments required many folks in print production and creative to create various versions of the catalog. Once created, it would be close to two months before the print production process was completed, resulting in catalogs being mailed to customers. Another month needed to go by before a proper statistical analysis was completed. So, sitting in this meeting, my choices were to recommend a three month process to test the hypothesis in just one catalog, or to quickly review as a team the past eight catalogs in an ad-hoc, unscientific manner, and make a decision as a team before leaving the room. It requires a lot of patience to learn the balance between making ad-hoc, gut-feel decisions and doing a thorough, accurate statistical analysis. You never really perfect the balance, you make mistakes, and you make the right decisions. The key factor in this is that you "make decisions". Decisions, positive or negative, move a business forward, increase accountability, and reduce red-tape. I once met with my marketing Vice President, when I was a statistician. I wanted a lot of time to do an analysis "the right way". He told me that he'd rather make five decisions with 80% accuracy than make one decision with 100% accuracy, because at the end of the day, you'd make four correct and one incorrect decision, whereas the "right" approach yielded only one correct decision. He preferred to make four right and one wrong decision each day than making one right decision. I've tried to balance his viewpoint with my statistical heritage of "being right". I've always admired the leader who is decisive, makes four right and one wrong decision, and takes accountability for the wrong decision. You are sitting in your Monday morning Executive meeting at a Multichannel Retailer. You review the numbers from the past weekend, and talk about the week ahead. At each meeting, you discuss one strategic issue. This morning, your strategic issue is the development of a corporate blog. Your executive team has many points of view. The Marketing Executive wants to use a blog as a way to improve the communication between customers and the leadership team. Maybe more important, the Marketing Executive knows that a key competitor just launched a blog that gives customers an opportunity to evangelize merchandise. The Merchandising Executive wants to use a blog as a way to communicate new and exciting merchandise to loyal customers, and that communication can only happen if a merchandiser or a copywriter is writing the copy. The Inventory Executive doesn't want to communicate new and exciting merchandise, because if customers love the new merchandise, the product will sell-out quickly, and customers will be disappointed. The Inventory Executive wants to use the blog to feature merchandise that is not selling well. The Information Technology Executive will manage and maintain a blog if one additional staff member is hired --- there are simply too many projects to manage with existing staff. The Operations Executive wants the folks who answer customer questions over the telephone to maintain the blog, because these folks are closest to the customer. The Finance Executive is opposed to a blog, because confidential corporate information could be released to the public, and suggests bringing legal representation into the room to discuss all of the bad things that could happen. The Human Resources Executive believes that a blog is a great way for some of the most talented copywriters to get increased exposure, especially in a year when the average employee will only get a 3% cost of living increase. The Database Marketing Executive loves anything that can potentially be measured. The Online Marketing Executive doesn't necessarily care about the content of the blog, but thinks the blog should be maintained by the Online Marketing department. These folks thoroughly understand the important link between search results and blogging frequency. The Catalog Marketing Executive wants to use customer feedback from the blog in upcoming catalogs as ways to market the benefits of the brand. The Public Relations Director is one-hundred percent opposed to any forum that allows customers the opportunity to bash the brand, and will side with the Finance leader in getting legal involved. Virtual CEO: How would you navigate these differing points of view? Given the information offered here, what would you decide --- blog, or no blog? If you decided to have a blog, which Executive would you support, and why? Are Marketing Bloggers Positive, Critical, Or Something Else? From November 1990 to March 2007, I worked at very large companies (Lands' End, Eddie Bauer, Nordstrom). And during that time, I read a lot of content about the companies I worked for from trade journals, and in recent years, from bloggers. My perception (the key word is "perception") was that "pundits" frequently took potshots at brands, that online commentary was overwhelmingly negative. But is this reality? Is this what marketing authors actually spend their time doing? To validate my hypothesis, I decided to "MineThatData". I reviewed 188 blog posts from April 1-7, 2007. These blogs were in Mack Collier's most recent list of the Top 25 Marketing Blogs. At the end of this post, I list the blogs that I tracked in this analysis. New Technology. These were discussions about how new technologies impact the world (Twitter falls into this category). Brand Analysis, Positive: These were general, positive discussions about brands. For instance, a blogger might complement Sprint for having outstanding phone design strategy. Brand Analysis, Negative: These were general discussions about brands, discussions about missteps that brands took. Maybe the blogger listed eight things that Starbucks can do to get back on track, as an example. Strategy/Opinion, Positive: These are posts where bloggers talk about strategic innovations that companies are implementing. Strategy/Opinion, Negative: Similarly, these are posts that bloggers talk about strategic innovations that the blogger didn't like. Links/News: Links to other sites, or announcements about news. General Commentary: Topics that don't fit neatly into previously listed categories. A "Gaping Void" cartoon about being "pink" might fit into this category! 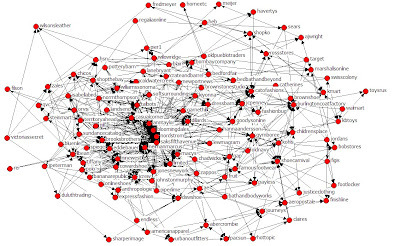 Blogosphere / Web 2.0 Commentary: Any discussion about other bloggers, use of "Social Media" or "Web 2.0". Results were classified for the Top 10 Blogs, Blogs Ranked 11-25, and were aggregated in total. Here's what the data tell us about the blog posts. My hypothesis about "negativity" is over-rated. Only fourteen percent of the posts are about brand commentary, about sixty percent of these articles were negative or critical. 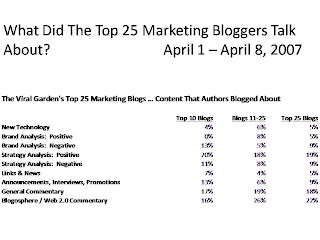 Interestingly, the top ten marketing bloggers were largely negative when talking about a brand. Bloggers 11-25 were largely positive in their commentary about brands. When talking about marketing strategy, this group of authors was positive by a margin of two to one. In other words, when describing a marketing strategy employed by a brand, the authors largely praised the strategy. Brands were criticized, as a whole, but individual strategies employed by brands were largely complemented. I did not expect to see this, going into the analysis. Twenty-two percent of the posts were about blogging, use of social media, or other "Web 2.0" issues. This is interesting to me. I suppose this strategy depends upon who reads these blogs. I'm fairly confident that the marketing departments in corporate America spend a lot less than 22% of their time discussing these topics --- though I could be wrong. It raises an interesting point --- should marketing blogs be aligned with what marketing departments frequently talk about? I'd say there is no reason for alignment. There is a difference in writing style between the top ten, and bloggers eleven through twenty-five. The top ten were more promotional, overwhelming more critical of brands, talked more about strategy, and talked significantly less about blogging/social-media/Web2.0. I didn't change the world with this analysis. But I did prove to myself that there are a lot of positive comments about what companies are doing, and a lot of positive comments about marketing strategy that are useful to folks. If the reader wants positive, useful commentary, s/he simply has to go out and find it. I left having a better attitude about what I'm reading than I had going into this analysis. What do you think? What do you think marketing authors should write about? What interests you most? What turns you off? Do you find bloggers to be largely positive, negative, or somewhere in-between? Blogs Included In This Analysis: Seth's Blog, Duct Tape Marketing, Gaping Void, Marketing Shift, Marketing Profs Daily Fix, Drew's Marketing Minute, Converstations, New School of Network Marketing, The Viral Garden, Influential Interactive Marketing, Logic + Emotion, Coolzor, What's Next, Marketing Hipster, Brand Autopsy, Church of the Customer, Marketing Headhunter, Diva Marketing, Marketing Nirvana, Jaffe Juice, Hee-Haw Marketing, Spare Change, Experience Curve, Pro Hip-Hop Marketing, Emergence Marketing. Creating Passionate Users was left out, for obvious reasons. Business is fun when all sorts of different strategies have a chance to succeed. In the last month, I've probably heard at least a dozen highly-qualified, experienced and bright leaders suggest that catalogs are responsible for driving at least 75% of all the sales that a website receives. If we listened to all of our industry leaders and vendors, we'd believe that a web-only business strategy could not possibly work. I really enjoy looking at the business model being managed by the folks at Zappos. This web-only strategy is responsible for close to a half-billion dollars of gross shoe sales, during 2006. Does that number resonate with you? This company is less than ten years old, does virtually no traditional marketing, no catalog marketing, and generates in the neighborhood of a half-billion dollars of gross sales. Half-billion. If you are a catalog industry leader or vendor, how do you explain this? How do you defend the catalog model of advertising in light of these results? Please leave your comments below. Some folks will tell you that Zappos has yet to deliver a profit, and suggest that is proof that a web-only marketing strategy cannot work. If a web-only marketing strategy did not work, Zappos would not generate close to a half billion dollars of gross sales. Customers are clearly endorsing a web-only business strategy. Management needs to figure out how to make money from a half billion in gross sales. 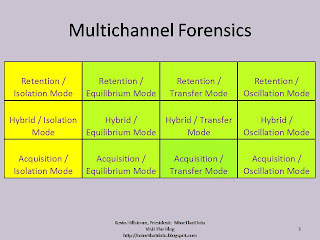 With just one channel, management needs to determine whether they are in Retention, Hybrid or Acquisition Mode. But more importantly, management decided that regardless of the mode, they need to GROW. You can only grow that fast by rapidly acquiring new customers. Zappos is spending a lot of money to acquire as many customers as possible. They succeed in doing this by offering free shipping, and now, by offering free overnight shipping. They lure customers via online advertising. Zappos uses every square inch of the homepage. In fact, I counted more than 160 hyperlinks on the homepage alone. This is not a clean, easy to read, brand-friendly presentation. Obviously, the customer likes it. Think of the hundred years of brand heritage my former employer, Nordstrom, has in selling shoes. How does that stack up online, verses Zappos, with no brand heritage? 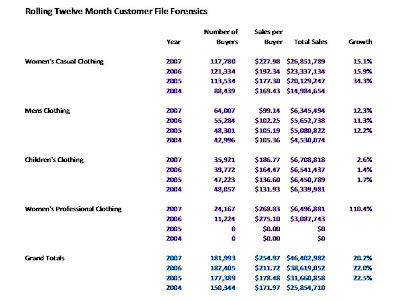 Multichannel Forensics come into play in a web-only business when evaluating merchandise. Zappos has eight merchandise divisions featured on the bottom of the page. It is highly likely that one of those divisions drive the lion's share of customer acquisition --- fueling future sales in all other merchandise divisions. It would also be interesting to see how much demand is generated by the top ten percent of the 151,000+ styles they maintain on their website. In a web-only business, the website is everything --- getting people to visit the website also means everything. I've observed comments in blogs where it appears Zappos employees leave hyperlinks to various products. Marketing an online-only business requires a completely different mindset than the mindset catalog/retail leaders have. It requires a different version of marketing DNA. I'm not convinced a lot of prior catalog/retail leaders have what it takes to run an online-only business strategy. The online-only business model requires a fierce focus on new customer acquisition, and a shift in Multichannel Forensics from how channels interact with each other to how merchandise divisions interact with each other. Once the leader understands how merchandise divisions interact with each other, keyword/search strategies can be employed that maximize customer acquisition opportunities. Your turn ... why is Zappos successful? If pundits continue to harp on multichannel strategies, why do customers flock to Zappos, a single-channel brand? Yesterday, we talked about the way a website provides information for the retail customer in a multichannel retail business. Today, the focus shifts to the role of the website in a multichannel catalog business. How can Multichannel Forensics help us understand how a website serves a catalog customer? Catalog customers are different than retail customers. In retail, the customer goes to the store. In catalog, marketing comes to the customer. This results in significant differences in the way a website serves a customer. In retail, the customer uses the website to obtain information, information that is ultimately used to purchase merchandise in a physical store. In theory, the website should be designed to take e-commerce orders, but is primarily designed to drive retail sales. The website reflects "the brand", if you will. The traditional catalog business faces very different challenges. Historically, the catalog was used to drive sales to a telephone channel. Today, the catalog is driving more sales online than through the catalog channel. This is where complexity occurs. 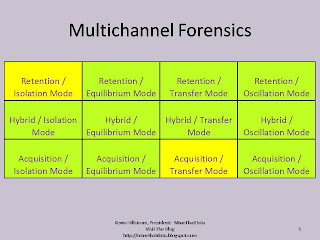 Multichannel Forensics can be used to help the marketer understand how the telephone and online channels work together. Frequently, catalog marketers have a telephone channel in "Hybrid/Equilibrium" mode. This means telephone customers have an approximate 50/50 chance of purchasing via the telephone channel next year. In addition, telephone channel customers are slowly moving online (hence, the designation of "Equilibrium"). 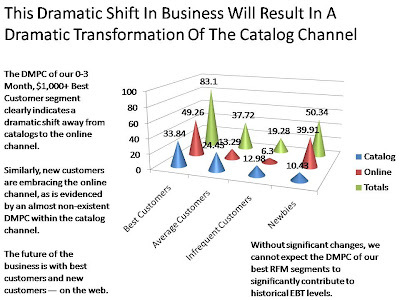 The challenge for catalog marketers occurs when analyzing the online channel. Online customers frequently operate in "Acquisition/Isolation" or "Hybrid/Isolation" mode. This means online customers are unlikely to use the telephone channel. Worse, catalog marketers often observe that the online channel has a lower annual repurchase rate than the telephone channel. This means that traditional catalog marketers are slowly "losing control" over the customer relationship. In the past, catalog marketing drove high corporate repurchase rates. 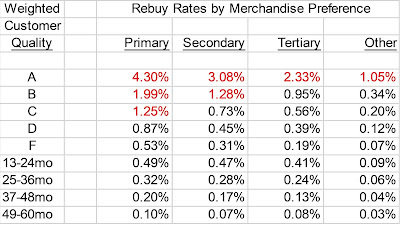 Today, catalog marketing frequently drives average corporate repurchase rates, and lower-than-average online repurchase rates. In other words, the catalog inspires the customer to "think" about buying something. The customer may choose to order over the telephone, may choose to go online, or may choose to put that online visit on hold. The longer the customer chooses to not go online, the less likely it is that the purchase will take place. Long-term, the catalog marketer must use a combination of catalog marketing, e-mail marketing, search marketing, affiliate marketing, portal marketing, and word of mouth marketing to achieve the same corporate repurchase rate (and spend per repurchaser) that was achieved in the old days of catalog marketing in the telephone channel. If this potpourri of marketing channels cannot achieve the same repurchase rate, order frequency, items per order, and price per item that the old-school catalog techniques produced, the catalog marketer faces long-term challenges. For the catalog marketer, the role of the website is changing. The website becomes the primary order taker for the catalog marketer. But more importantly, online marketing techniques must become effective enough to replace the ever-decreasing effectiveness of catalog marketing. The website must evolve as well, providing the information, entertainment, and additional product assortment necessary for the brand to maintain historical corporate repurchase rates (and spend per repurchaser). For the catalog marketer, the website plays a very different role than the website plays for the retail marketer. This is not a dynamic that is well understood by multichannel pundits. Ultimately, our customers will decide the role of a website in a multichannel retail business. Catalogers are experiencing a very different set of dynamics when strategically considering the role of a website. There is an odd interplay between catalog advertising and online purchasing that causes catalogers consternation. For retailers, the relationship is much easier to understand. 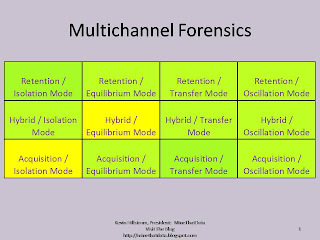 Multichannel Forensics suggest that when two channels are involved, one channel frequently benefits from the efforts of the other. In the case of the online channel and the retail channel, retail is ultimately the "order taker". The online channel frequently acts as the "information channel". As an example, I purchased a television at Circuit City last week. I did all of my research online, comparing Circuit City to Best Buy and other retailers. I chose Circuit City because they had a better price on the television I wanted, and installation was one hundred dollars cheaper than it was at Best Buy. In this case, the internet provided the forum for my shopping experience. Circuit City's website did a reasonable job of presenting information to me. I even put my television in the shopping cart, so I could see the price. But the website did not "convert me", from a traditional web analytics standpoint. Some pundit will clobber Circuit City for having a paltry online conversion rate, for failing to convert my shopping cart. The website did exactly what is was supposed to do --- and receives no credit for the work it did. The retail channel took my order. An installer (another channel???) will hook me up next week. If this relationship exists, you'll easily see it in your Multichannel Forensics analysis. The online channel will be in "Acquisition/Transfer" mode. This means that, for online purchasers, fewer than forty percent of them will purchase again online next year. Furthermore, those customers are likely to switch their allegiance to the retail channel. The retail channel operates in "Retention/Isolation" mode. This means that at least sixty percent of last year's retail channel customers will purchase in retail again next year --- and these customers are unlikely to purchase online next year. In this example, the website plays maybe the most important role in connecting the customer to the retailer. The internet is a gigantic ecosystem where customers research merchandise opportunities. The website is the retailer's best chance to provide a customer the information necessary to chose the retailer's brand over another retailer. The website is a much smaller, more controlled ecosystem, playing a critical role in the purchase process. E-commerce should be viewed separately from the role of the website. E-commerce is only about taking an order that is to be delivered to a customer. When we separate E-commerce from the website experience, we immediately open ourselves to an endless array of multichannel opportunities. Retail, because of its three-dimensional, human, warm, hopefully inviting nature, will garner the vast majority of purchases. The website, not E-commerce, becomes the critical link between customer and brand in multichannel retail. A Multichannel Forensics analysis should illustrate this fact --- one should see that E-commerce customers transfer back to retail, while retail customers generally maintain their channel loyalty in stores.